A guest post from our new Development Associate, Ari Rinzler. Passover is about telling stories, recalling history and examining contemporary times. This makes for lively banter and pretty good discussions over hillel sandwiches – and it also makes for what is absolutely my favorite holiday. Storytelling and re-telling the past and questioning all of the above is inextricably linked to what it means to be Jewish – “Maggid”, the Hebrew word for “story”, is at the root of the word, haggadah, which is the written order of prayer, songs and the story of the Jew’s exodus from Egypt and freedom from slavery, collectively read each year during Passover. Likewise, the meal itself is an integral part of the story, and is purposefully symbolic; we eat the Charoset, a mixture of chopped apples, walnuts and honey, represents both the toil of the slaves and the sweetness of freedom; we eat the bitter herbs, horseradish to remind us of the bitterness of slavery; and we eat springtime fare to symbolize renewal and new beginnings. Every year, I’m in charge of the matzoh ball soup. Made from ground matzoh, the unleavened bread that marks the journey out of Egypt when the Jews didn’t have time to let their bread rise, this soup is a real crowd pleaser. I use a vegetarian broth made with Better than Bouillon which tastes fantastic – all the meat eaters concur, I kid you not. Mix all matzo ball ingredients in a bowl. Cover and place in the refrigerator for 30 minutes. The cold temperature is important for fluffy matzo balls. Bring 1 1/2 quarts of well-salted water to a boil in a medium sized pot. Reduce the flame. Wet your hands. Form matzo ball batter approximately 1-inch in diameter into the palm of your wet hands and roll loosely into balls. Drop them into the simmering salt water one at a time. Cover the pot and cook them for 30 to 40 minutes. About ten minutes before the matzo balls are ready, bring prepared stock to a simmer with the sliced carrot in it. 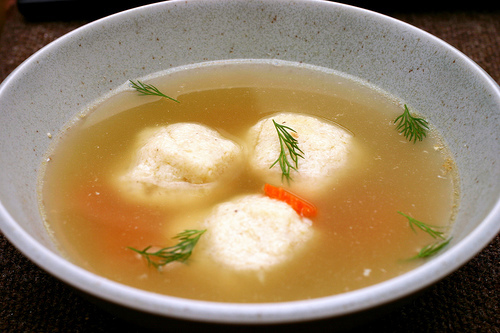 Ladle some soup and a couple matzo balls into each bowl and top with a couple snips of dill. Eat immediately.